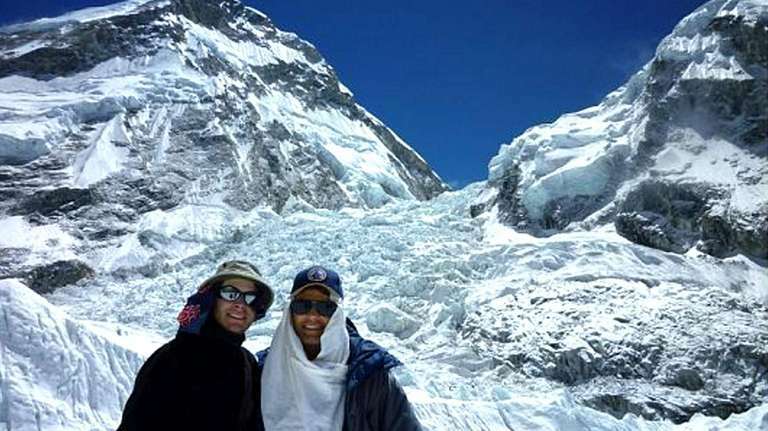 WHEN Richard Birrer, a Locust Valley physician working in Saudi Arabia, reached the top of Mount Everest with one of his twin sons on May 25, the men were elated but cautious, as one might expect from climbers with a history of mountaintop experiences. The ascent of Everest, Birrer said, meant that he and his son had reached the tallest peaks on all seven continents, putting them among an elite group of mountaineers who have done so. "You really are focused on not falling off," Birrer, 60, said of being on Everest's 29,035-foot summit. "You are walking a knife's edge. On either side, if you should slip, you are gone." According to a Dutch website, 7summits.com, fewer than 300 mountaineers worldwide have had the so-called Seven Summits under their climbing boots. Jason Martin, operations manager at the American Alpine Institute, a climbing school and guide service in Bellingham, Wash., said reaching pinnacles of all seven summits is increasingly popular but remains a significant feat. "It's becoming more of what it probably should be, a personal achievement," Martin said, "rather than something to make a name in the climbing world." Birrer said he didn't have grand ambitions when he began climbing in New York State at age 34. Yet his pastime became a family passion. In 2000, Newsday chronicled how Birrer, sons Richard Jr. and Chris, now 29, and a daughter, Danielle, now 28, were closing in on climbing the highest points in each of the 50 states. Over the years, the family - often including Birrer's wife, Christina - also made climbing trips abroad. In the spring, Birrer and Richard Birrer Jr. were prepared to confront Everest. The elder Birrer had unfinished business. In 2005, Birrer said he was an expedition physician during an Everest summit attempt when a tentmate died of a heart attack. The group had to turn back. "I knew darn well that I couldn't say to people, 'I knew I could have done it,' " he said, referring to reaching the summit. His son Richard said that his father, like so many climbers, simply had to try a second time. "There is almost this draw, this weird attraction," the son said. "You have to get back to the top." In early April, father and son arrived in Katmandu, flew to Lukla in Nepal, and hiked the roughly 60 miles to an Everest base camp, where they spent six weeks adapting to the 17,300-foot elevation, the elder Birrer said. The deprivations of base camp were extreme, Birrer said. The altitude affects digestion and climbers lose weight. It's so cold that people's respiration ices up the inside of tents. Every year, by the time summit attempts become possible in mid-May, many already have given up, Birrer said. "It's absolutely torture," he said. "Nothing is easy." The men - participating in an expedition that included more than a dozen others - made their first attempt on May 8, but bad weather stopped them. Two more bids were similarly thwarted. On a fourth attempt, the father and son made good progress, and on May 24 at about 10:30 p.m., they set out from a camp just below the summit. Around 6 a.m. the next morning, they made it. The younger Birrer arrived at the peak first, with his father not far behind. "It is a strange thing to think you're on top of the world," the father said. "You can actually see the curvature of the earth." The younger Birrer, who is a banker in London, said both he and his father would have loved to have his brother and fellow Chaminade High School graduate Chris - who has five of the seven summits under his belt - along with them. Chris Birrer was unable to make the Everest trip because of job commitments. Birrer Sr., who runs medical operations for Saudi Aramco, Saudi Arabia's government-owned oil corporation, said he has a few future climbs in mind, but thinks it's time to hang up his "crampons and ice ax." His son doesn't think his father is serious. Richard Birrer Jr. has his own eyes on some peaks in the Swiss Alps. "I haven't even been back one month and I'm already thinking about the next adventure," he said. "It's kind of in your blood."